While most of the historical events that took place in L’viv, Ukraine, during and after World War II are being successively researched, less attention has been paid to their representation throughout the Soviet period and its transformation afterwards. 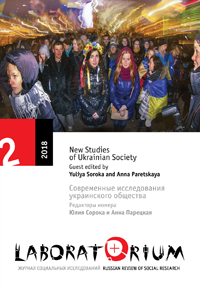 This article looks at two war museums in L’viv representing the most prominent competing historical perspectives on World War II in Ukraine today: the Soviet narrative of heroism and liberation, as put forward by the Museum of the History of the Carpathian Military District, and the Ukrainian narrative of a no less heroic fight for freedom and self-determination, as presented by the Museum of the Liberation Struggle of Ukraine. The first was the state narrative of the Ukrainian Soviet Socialist Republic, is still supported by many Ukrainian citizens and politicians, and continues to influence ideas about how war should be commemorated; the promoters of the second have hoped to make it the new Ukrainian master narrative, but they encounter a variety of difficulties, which will be addressed in this article. The article examines the circumstances, motives, and goals of the museums’ creators, of the exhibitions’ narratives (and silences), and their design. The analysis is based on empirical research conducted in L’viv between August 2015 and October 2017 as part of the interdisciplinary research project “L’viv: Museum of War,” a collaboration between the artist Ekaterina Shapiro-Obermair and the historian Alexandra Wachter. Wachter, Alexandra, and Ekaterina Shapiro-Obermair. 2018. “From Soviet to Post- or Anti-Soviet: Two L’viv Museums of War in Search of a New Ukrainian Narrative of World War II”. Laboratorium: Russian Review of Social Research 10 (2), 52-79. http://soclabo.org/index.php/laboratorium/article/view/762.